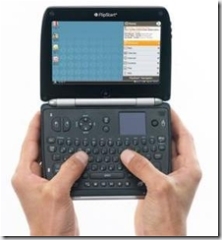 Micro-mini laptop design is just wrong! I love the convenience of laptops, the portability, the 'I am cool' factor, however, I have consistently balked at anything smaller because it simply becomes impractical to use for long periods of time. Case in point is the recent release of the FlipStart. It really looks good but the problem is not in the looks, the battery life, or the CPU. Take a long hard look at this picture and tell me what the problem is? Who in their right minds wants to write anything of significance with their thumbs. It is just not natural. I have spent a tremendous amount of time attempting to ensure that my QWERTY typing skills are adequate for today's world of business only to be reduced to using my thumbs! To be sure there are some nice mouse like artifacts that make using the FlipStart tolerable, but this is not a solution for typing more than a couple of sentences, and this is not just me. If you follow an SMS message thread you will see that people just do not want to type whole sentences on small devices (e.g. lol, btw...). I do have a proposal, if not a solution, that may make things a little easier and faster for everyone. It does not require that you ditch all your hard earned typing skills. One handed typing using the Half QWERTY, Half Keyboard layout. Promote a keyboard scheme that is basically half the QWERTY keyboard as in the following diagram. This would allow you to hold the device in your left (if right handed) and type with your right. 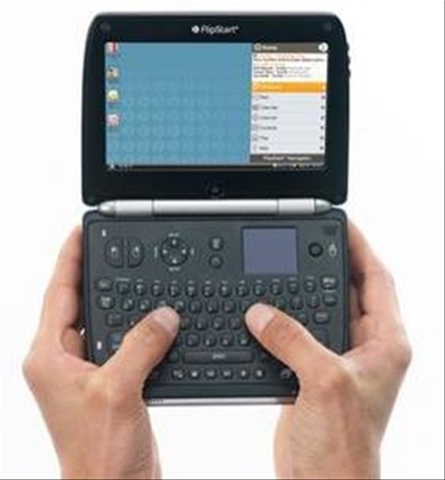 To get to the other half of the QWERTY layout you would have to use flip function but that is the point at which you would need to learn new skills. I do not pretend to have run any practical test on this system myself but there are people out there promoting and using this system.